Scent family includes Santa Monica bath bomb, Ruby Red Slippers bubble bar, Potion perfume Holiday bubble bar, and “Oops Almond Kisses’ moisturizer. Lush Times 2005 description: Potion smells of roses and tangerines but mostly of carnations. We’ve been asked to bottle the scent and sell it as a perfume but until that happens, the best way to smell of Potion is to smooth this wonderful lotion all over your body. This has the added advantage of moisturizing your skin with a light touch of almond oil and cocoa butter, softening it with rose petal infusion and toning it with fresh tangerine. Take it on holiday as an after sun too. Review: Potion is lighter and the carnations smell kind of spicy like cloves and then there’s the addition of the tangerine and is one of the sexiest summer scents. I advise you to find some. Carnation is great. Ingredients: Rose Petal Infusion (Rosa centifolia), Almond Oil (Prunus dulcis), Cocoa Butter (Theobroma cacao), Glycerine, Stearic Acid, Triethanolamine, Fresh Tangerines (Citrus reticulata), Rose Absolute (Rosa centifolia), Carnation Absolute (Dianthus carophyllus), Tangerine Oil (Citrus reticulata), Cetearyl Alcohol, Perfume, Methylparaben, Propylparaben. 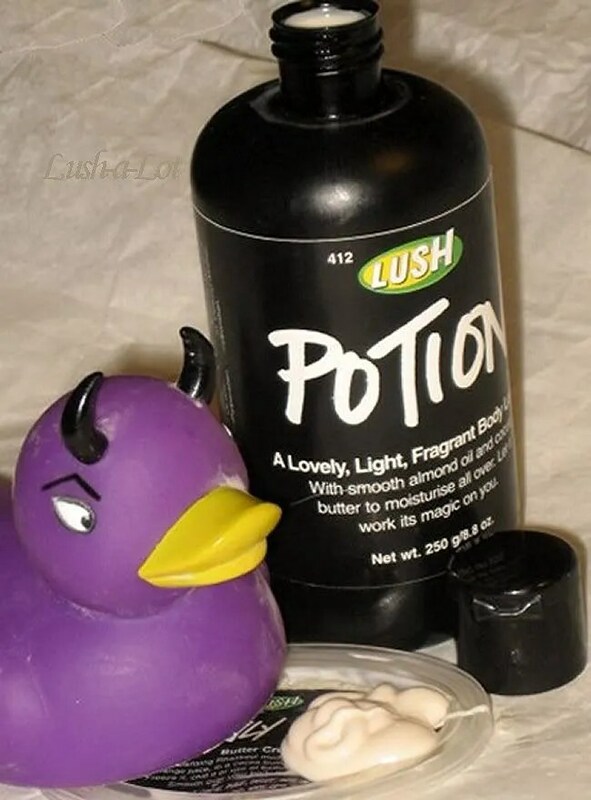 Posted on August 25, 2015 by Lushalot	• This entry was posted in Lotions, Lush Kitchen menus and product demos and tagged carnation, lush kitchen, potion body lotion, potionbody lotion, retro, rose, tangerine. Bookmark the permalink.